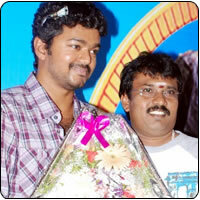 Ilayathalapathy Vijay celebrated his 37th birthday yesterday (June 22, 2010) at a marriage hall in Palavakkam. Speaking at the function, the actor disclosed that he would adopt Pandiaraj, who scored high marks in the recently concluded 12th standard exam, and help him pursue engineering course. Pandiaraj scored 1130 marks despite working at a tea stall, disclosed Vijay. Directors Lingusamy, Jayam Raja, Perarasu, producers R B Chowdhury, AVM Balasubramaniam, Sangli Murugan and others wished the actor in person.